Featuring pleasant rooms with modern facilities including a satellite TV and free wired internet, Crescent Homes ECR is situated just 500-metres from the town of Thiruvanmayur. The property offers free private parking and 24-hour room service. 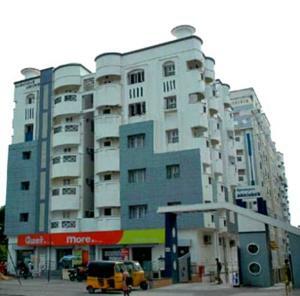 Crescent Homes ECR is 2 km from Besant Bagar Beach and 6 km from the T Nagar shopping area. Both Chennai Airport and Railway Station are approximately 8 km away. Rooms are equipped with a satellite TV and personal safe. Featuring wood furnishings, each room has a seating and dining area. Guest can make bookings at a travel desk. Landry services and a 24-hour front desk are also available. Sightseeing, airport and railway station transfers can be arranged. The 24-hour restaurant on the 5th floor serves delicious Indian and international dishes. A daily breakfast is also available. Free! One child under 12 years stays free of charge when using existing beds. One further older child or adult is charged INR 450 per night and person in an extra bed. Maximum capacity of extra beds in a room is 1. There is baby beds in a room is 0 capacity for cots in the room. Any type of extra bed or crib is upon request and needs to be confirmed by the hotel. Supplements will not be calculated automatically in the total costs and have to be paid separately in the hotel.